A Visitor Services Representative welcomes a visitor in our new admissions area. Sunday, February 1st, Pittock Mansion opened for its 2015 season after a month of annual maintenance. In addition to the usual dusting and polishing of all 16,000 square feet of the Mansion, this January staff were busy perfecting a new admissions area created in the previously unused 3rd bay of the garage. The new ticketing area and entry experience, designed by local firm Alchemy of Design with input from our Visitor Services staff, was one of the recommendations from the plan developed in 2012 to improve the visitor experience overall. The specialized admissions area will alleviate congestion in the mansion foyer and create a transition between purchasing tickets and experiencing the Mansion. 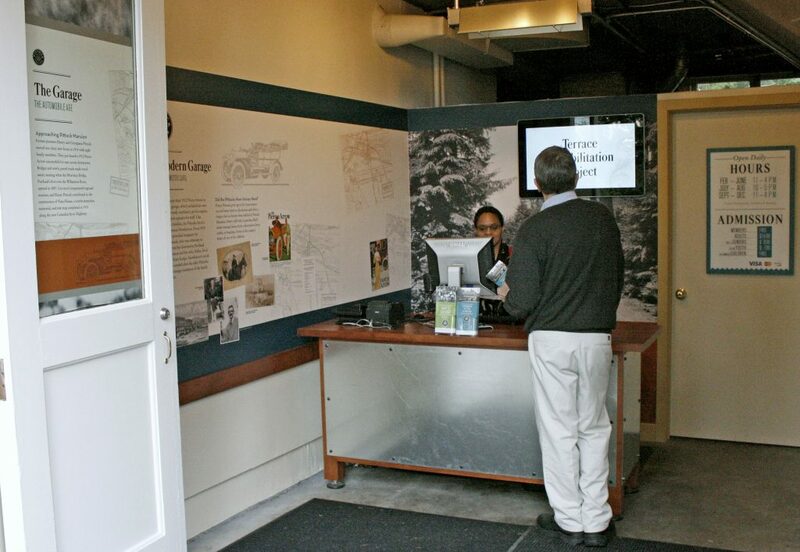 In addition to being a dedicated space for welcoming visitors, the admissions area also tells the story of the garage’s past and touches on early 1900’s transportation in Portland. The Pittock’s kept their car, a 1912 Pierce Arrow, in the three-bay garage which included its own 500-gallon gas tank, mechanic’s pit, and an apartment upstairs for staff. Like many wealthy families, the Pittocks employed a chauffeur, Herman Hawkinson. From 1914 until 1918, he provided transport for Georgiana Pittock. The admissions area project is just the latest in improvements around the Pittock. In October 2014 we installed our improved way finding signs on the grounds and indoors, upgraded the permanent exhibit, and increased visitor engagement by adding multi-sensory and interactive elements in the exhibits. Stay tuned throughout 2015 for more improvements to Pittock Mansion’s museum experience!